Although it was almost completely destroyed early in the 11th century, you can still see some remains of Constantine’s church; but you have to go outside the present Holy Sepulcher complex in order to find it, as the the basilica was much larger than its replacement. 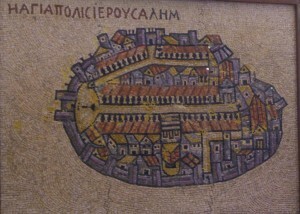 The Madaba map of Jerusalem, a 6th century mosaic discovered in a church now in modern Jordan, clearly shows Constantine’s basilica as being situated on the Cardo – the main north/south thoroughfare of Byzantine Jerusalem. In the Alexander Nievsy church, a 19th century Russian Orthodox building just east of the Holy Sepulcher, there are some ancient steps which it is now believed were part of the original entrance to Constantine’s church, on the Cardo. In the Nievsky church there are also the remains of some even earlier structures; an arch, which has been reconstructed, is believed to have been part of an entrance to the city in Roman times. This may even have been the the “Judgment Gate”, through which Jesus was led from the city to the hill of the crucifixion, as suggested by the painted reconstruction hanging on the wall.